Summary: Laia's life is changed forever when a group of the Empire's brutal soldiers - the Masks, so named for the eerie and off-putting silver masks they wear, which meld to their faces - raid her family home one night. After her grandparents are slaughtered and her brother taken away to endure god knows what, she seeks out the Resistance fighters to help her get him back, becoming a slave in the household of the cruel and violent Commandant of Blackcliff Academy. Elias' life is changed forever when, instead of graduating from Blackcliff and then deserting his future as a Mask (as he had planned), he becomes one of the four Aspirants fulfilling a prophecy to vie for the title of Emperor. Now instead of being free of Blackcliff, the Empire, and especially the Commandant (who also happens to be his mother), he finds himself committing the unspeakable acts he never wanted to commit in the first place, for a chance at a greater freedom that he had been promised. She is a slave, and he is a soldier, and both of them want nothing more than to be free of the Empire, but they will both have to risk life and limb (individually and together) before that can happen. Thoughts: I'm going to be honest with you - I resisted reading this one. 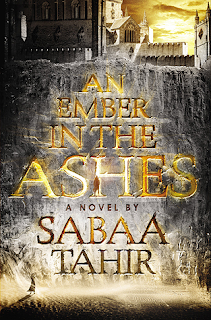 I had bought it a while ago, gotten through the first few chapters, and then couldn't continue because this world that Tahir has created - based upon the Roman Empire, by the way - was so brutal, so bleak, that I just couldn't. I'm a sensitive soul, okay? However, I have heard so many amazing things about this book (and it has won awards! ), that I knew I would have to bite the bullet. Just because something is unpleasant, it doesn't mean it isn't good for us. There is treachery, and death, and demons, literal and personal. This book is intense, and I feel like reading it has taken years off my life, but I don't regret it because it was also beautifully written and engrossing, and at times, utterly heart-breaking. The chapters alternate through Laia's and Elias' points of view, their separate journeys crossing paths and entwining. Each of them has a fascinating backstory, and I read eagerly, equally engrossed in both of their characters. (Not gonna lie - I ship it.) Both of them grapple with some very difficult choices that lead to serious consequences, and seeing how they grow and change because of their choices was what kept me going. I stayed for them. But again, it was hard. I don't like reading too much about ugliness if I can help it, and this book has a lot of it. It's necessary, though - a cold reality of the world Tahir has created. It's supposed to horrify you. It's supposed to get a reaction from you. It never felt gratuitous to me - just very difficult to take in. It's an amazing book, and I recommend it. I think there is much to be gleaned from this book (apparently it's a series - the sequel is coming in a few months), and I feel like I have definitely gotten something out of reading it, but man... it definitely pushed me out of my comfort zone.